See how easy it is to hang frames, mirrors and other wall art to almost any surface with TrackMaster® Picture Hangers. They only take a minute or two to install and require only those tools normally found in the home. The following subpages provide written instructions, photos and product application ideas to make hanging picture frames with TrackMaster simple, quick and secure. The first link is for downloadable files to print, while the other four include photos of people actually installing picture frames with TrackMaster products. How-To videos for wood and metal frame picture hangers. Downloadable picture hanging instructions for wood or metal frames and security accessories. The TrackMaster hangers are inexpensive and they protect fine art that cannot really be insured - once one-of-a-kind pieces are damaged or destroyed, they can seldom be repaired or replaced. The few dollars spent on TrackMaster® Picture Hangers may be worth considerably more than the hundreds of dollars spent on insurance policies. TrackMaster® Picture Hangers are known by professionals installers to make hanging multiple frames faster and more accurate because of the built-in adjustability. This makes it simple to adjust for minor measuring errors without having to reattach hangers to walls. The wood frame adapter slides along the hanger from side-to-side. The standard channel on universal metal frames fits onto the hanger and also adjusts by sliding to the right or left. The other advantage to the slide adjustable hangers is that it makes it easier to achieve symmetry among grouped picture frames. That way framed pictures, paintings, photographs and other wall art can be properly spaced for the most attractive display of multiple pieces. Bottom rail supports help keep picture frames in place once the perfect hanging position is selected. TrackMaster® Picture Hangers eliminate the need to constantly reposition framed art that moves due to bumps or slamming doors. While bottom rail supports also provide a measure of security, accessories available on HangFrames.com provide theft prevention for your valuable framed pictures and art. 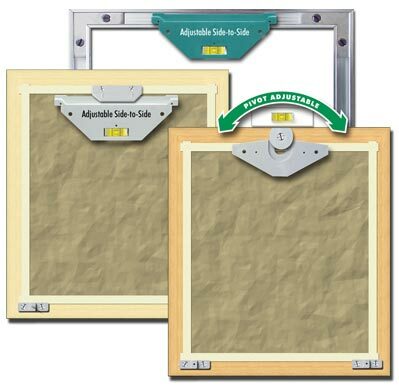 They are specifically designed to work seamlessly with TrackMaster® Picture Hangers for wood or metal frames. See why hotels, restaurants, schools and business offices prefer TrackMaster® Picture Hanging Kits to make installations go quicker and to protect their valued wall art. Order some adjustable picture hangers today (we guarantee your money back if you are not 100% satisfied with our picture frame hangers). Install in Drywall without Studs! TrackMaster® Picture Hangers don't need wall studs to hang securely. Read more about advanced features that make special picture frame installation projects easy!